Many of us of a certain age will recall this verse from the production, Godspell, in 1971. It is taken from the Prayer of St Richard written in the 13th Century when Richard of Wyche was Bishop of Chichester. Like most medieval clerics, Richard took his name from the place he was born, Wyche in Worcestershire and now known as Droitwich. Born in 1197, he was from a land-owning, farming family and†went to study in Oxford. On the death of his father he returned home to help run the estate but prosperity meant that he could†soon pursue†his calling from God and returned to Oxford, where he became the earliest Doctor of Canon Law. He may also have travelled to study at Paris and Bologna, both leading centres of theology. Between 1235-37 he was chosen for the office of chancellor, which meant he was the legal and administrative head of the university. In those times there were many conflicts between kings and bishops. Henry III learnt that Richard had been appointed Bishop Elect for Chichester over his own clerk and felt undermined. It was two years before the King, threatened with excommunication by the pope, agreed to accept Richard into the palace at Chichester. Early in the 13th Century, Pope Innocent III called for reform of the church, to raise the standards of the parish clergy, educating them in the need for moral discipline. Bishop Richard was a keen†advocate of such reform. His hospitality, teaching and patience won him the hearts of all who knew him and the apparent miracles performed by Richard during and after his life set him apart from all other clergy. One of the miracles frequently mentioned happened at on the Selsey peninsular when the wind blew out all the candles. Shortly afterwards it was seen that Bishop Richard’s candle was once again alight. The miracle for which Richard is chiefly known is that of the overturned chalice. The story tells that Richard, tired from his labours, was celebrating mass and dropped the chalice containing the consecrated wine. Amazingly, none was spilled. This miracle is depicted on the coat of arms of St Richard as a cross, with a cup in each quarter of the shield. The statue of St Richard by Harry Hems, 1894, in the cathedral, shows an upright chalice at his feet. In 1252 Richard took a commission from the pope to preach the latest crusade throughout Sussex and Kent,†urging people to ‘take the cross’ or give money. He shared the view of his contemporaries that Jerusalem and the Holy Land be regained for Christendom. The tour took its toll on his health and he died†in Dover on the 3rd April 1253. His body was returned to Chichester Cathedral. Three years after Richard’s death, the Bishop and Canons of Chichester supported by Henry III, petitioned the pope to enquire into Richard’s life and miracles. On 22nd January 1262, Richard was canonised and the pope ordered that each year his feast should be celebrated on the 3rd April. Pilgrims came to pray on the 3rd April, his heavenly birthday, as well as on the ‘Feast of Translation’ on the 16th June. The annual payments from parishes to the cathedral came to be known as ‘St Richard’s Pence’. At the turn of the 20th Century the Prayer of St Richard was published and in 1930 an altar was placed on the site of the shrine in the cathedral, after which it became the focus of regular pilgrimages. In 1953, on the 700th anniversary of St Richard’s death, George Bell, Bishop of Chichester called for a renewal of discipleship in the name of St Richard and a pageant took place, in which The Acts of St Richard were performed in front of the Bishop’s palace. All visitors to the cathedral are invited to light candles and leave requests for prayer at the shrine. These are offered at the altar during the Cathedral Eucharist every day. 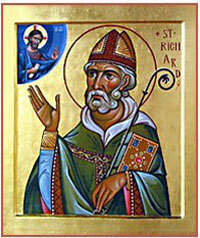 St Richard is the patron saint of Sussex. Prayer of St Richard written in the 13th Century when Richard of Wyche was Bishop of Chichester.